The first step in starting off the hunt for your desired property is to get in to contact with the House Hunt team where you can discuss your property requirements. You can contact us by registering on our website, visiting our office, calling or sending us an email (view our contact us page for more details). Once we have a clear understanding of what you want we will provide you with a selection of properties that meet your criteria. The next step is to decide on potential properties and to arrange viewings by contacting a member of the House Hunt team. We can take you to the property from our office or arrange to meet you at the property. By viewing the properties short listed, you will be able to chose the best house that ticks all your boxes. All viewings must be booked at least 24 hours beforehand in order to give current tenants notice. On the day of your viewing a staff member will show you around the house and answer any questions you may have. Once you have found your desired property the most important action to take is to RESERVE YOUR PROPERTY ASAP! Our properties are in high demand, so to avoid any disappointments we would urge you to take quick action. In order to reserve the property we require a £100 non refundable holding reservation fee per person. Once this payment has been made, we will take the property off the market for a period of 7 days. This will give you sufficient time to obtain the remaining paper work and payments. If at any point of the process you have any queries please do not hesitate to ask a friendly member of the team who are always there to help. Before signing the contract we will require a few important documents and payments to be made, you will be given a period of 7 days to obtain these. The documents needed will be a completed Student Application Form and Guarantor Form along with a guarantor ID. Along with two forms of ID for yourself (your student ID card and any other form of identification which clearly shows your full name and address e.g. Driving license). On signing the contract a few final payments need to be made before you can move in. Don't worry our friendly staff will clear any concerns you may have at this point. The final payments needed will be a security deposit which is paid as a one off fee and is refundable at the end of the tenancy providing all contract clauses have been met. Also a non refundable administration fee will need to be paid at the signing of the contract. For more information on the deposit please visit our FAQ page. A copy of our handbook will be given to the lead tenant from each property. The handbook will contain all important information for tenants during their tenancy. 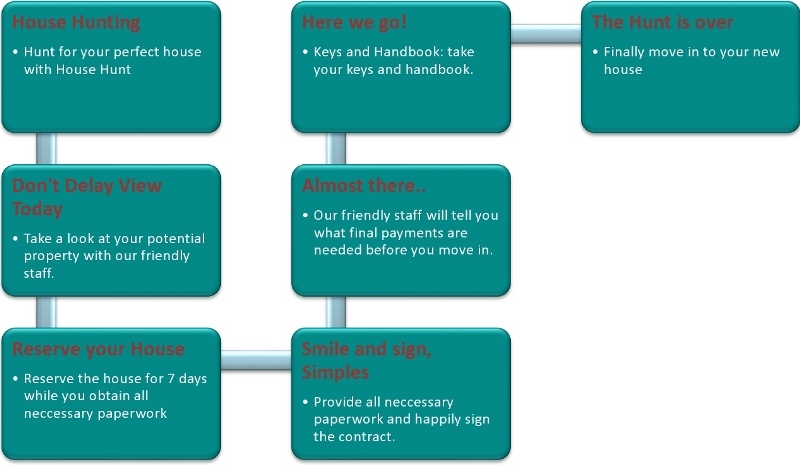 On the day you move in each tenant will be given a separate set of keys either by us or the landlord. The set of keys will contain the bedroom key for that specific individual's room and a front door key. Finally the hunt for your house is over! The house will be professionally cleaned to a very good standard and inspected before you move in. Within the first 7 days if you notice any maintenance issues that we have not picked up on, you should let us know and we will get this sorted. We are always here to help you with any problems or concerns you may have throughout your tenancy, and hope you enjoy your stay with no complaints.